Skin conditions may appear trivial on the surface of matters but the issues are more than skin deep. Your skin is your body’s largest organ and anyone that has suffered with skin conditions, including myself, knows that they deeply affect your self confidence, comfort levels and can affect your work and personal life. This in turn can cause stress on top of any existing stress and this can in turn affect your skin and so the viscious cycle continues. Suffering with skin conditions is what led me on my path to discover the benefits of colon and tissue cleansing and naturopathic nutrition. After trying the conventional route I realised that the medical industry does not have the solutions for chronic skin conditions. They only have the plasters and bandages to temporarily mask your condition be it through steroid creams, antibiotics, antihistimines, the contraceptive pill or roaccutane. My one dream was to feel comfortable in my own skin, the natural way. I am writing this blog post because I want to share with you the simple solutions that will enable you too to have the skin you once had or the skin you really want to have so that you no longer have to suffer with eczema, psoriasis, acne or dry, itchy, flakey or inflammed skin. Considering that your bowel is 5 to 6 feet long and is as long as you are in height, it would be a good for us to ensure your plumbing work is in order. So let’s make sure your bowels are healthy, with good regularity and fully stocked with friendly bacteria. If not then the toxins have to come out somewhere and this is probably happening right now, unfortunately, on your skin! A modern and ‘convenient’ diet and lifestyle is not so convenient for your colon or skin. Factors such as stress, ignoring the ‘urge to go’, diets high in gluten and dairy, processed meat, too much red meat, refined carbohydrates and sugar, alcohol and fizzy drinks, artificial preservatives, sweeteners and other chemicals and a low intake of water and vegetables will clog up your colon and in turn your skin. A course of colonics helps to clean out your gut, exercise your bowel to restore peristalsis, remove yeast overgrowth such as candida and create a fresh environment for friendly bacteria to implant and look after your immune system and your skin. If you suffer with skin conditions such as eczema, acne or psoriasis you are most certainly intolerant to dairy products, particularly cow’s products as the protein molecules are large and difficult for us to digest. Lactase, the enzyme that breaks down the milk sugars, lactose, dies down from the age of 2-3 when you move on to solid foods. If you were born prematurely you are likely to be lactose intolerant as the lactase enzyme only increases in the third trimester of pregnancy. Did you know that the enzyme lactase is completely non existent in ethnic groups such as africans, asians, orientals, indians & hispanic Americans? So if you are from one of these ethnic backgrounds and suffer with skin conditions you are almost certainly intolerant to lactose. Lactose free products are not the answer as you may be sensitive to milk proteins, the most common being casein, so avoid packaged foods containing casein, caseinate, lactose, sodium caseinate or whey. 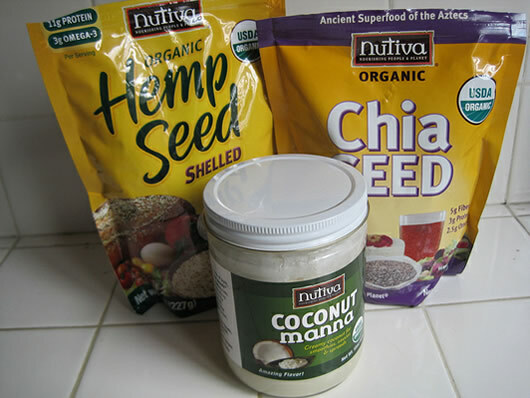 If you currently take whey protein powders you can switch to vegan protein powders such as hemp or pea protein and chia protein powders. You may even be thinking that dairy is not part of your daily or weekly diet but what about your daily trip to the coffee shop? The ‘latte’ or ‘flat white’ coffee shop phenomenon has meant you are all drinking gallons and gallons of milk without thinking twice about it. Breast milk for babies is best but do we really need to be suckling from a cow as fully grown human adults? Cow’s milk contains enough hormones and proteins to turn an 80lb calf into a 1000lb cow in one year and these hormones occur naturally, so drinking organic milk makes no difference and is not suitable for us mere mortals. 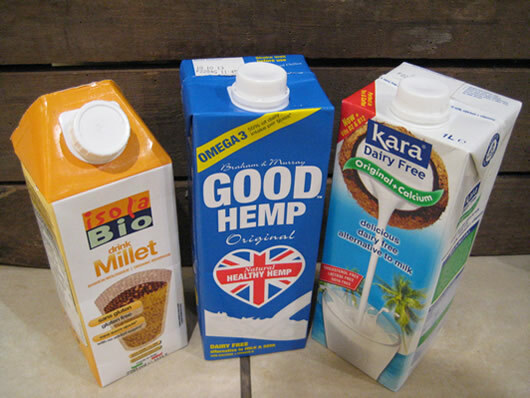 The truth is we do not need milk at all, however for those of you that want a milk substitute you can try hemp, millett or coconut milk. Just how much cheese are you eating? Is it in your daily sandwich? On your pizzas, salads or after dinner cheese board? Perhaps you are a vegetarian that has given up meat and decided to replace it with cheese! If so you need to investigate alternative vegetarian sources of protein such as quinoa, buckwheat, amaranth, millett, gluten free oats, sprouts, seeds (particularly hemp and chia), nuts and tempeh. Skin disorders such as eczema and acne almost always indicate a zinc deficiency. A zinc deficiency will mean you are more prone to infections, poor wound healing, lack taste and smell and you may be suffering with macular degeneration and impaired eye sight. Your zinc deficiency could be due to drinking tap water from copper pipes, or if you are a woman that has had the copper coil fitted for contraception. 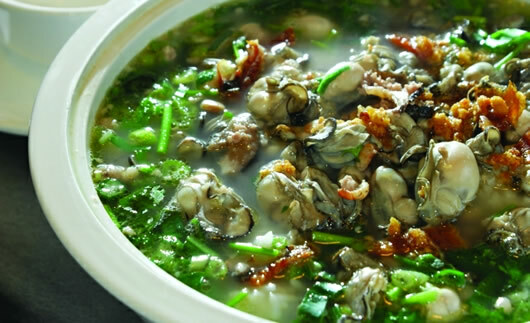 One of the highest zinc food sources is oysters. However avoid raw oysters from the ‘champagne and oyster bar’ are best avoided due to parasites and bacteria. Try steaming your oysters instead. For you non oyster fans out there you can top up your zinc with Pumpkin seeds, pecans and brasil nuts. In order for you to be healthy and disease free and have healthy glowing skin, your body fluid must be kept at an alkaline level pH 7.4 so you must eat enough alkaline forming foods to make body fluids alkaline all the time. If you achieve the correct acid.alkaline balance not only will you have great skin but you can prevent almost all sicknesses including cancer, heart disease, heart attack and AIDS, osteoporosis, fatigue and infertility. So what causes acidity in your body? Diets low in vegetables, and too high in animal proteins, alcohol, table salt and pesticides push and lifestyles high in stress your pH balance into acidity. Ideally your diets should consist of 80% alkalising foods. However it important for you to understand that a food’s acid or alkaline forming tendency in the body has nothing to do with the actual pH of the food itself. For example, lemons are very acidic but the end product they produce after digestion and assimilation are very alkaline so, lemons are actually alkaline forming in your body. Meat will test alkaline before digestion, but it leaves very acidic residue in the body so animal meat is very acid forming. All grains are acid forming except for quinoa, buckwheat and millett. 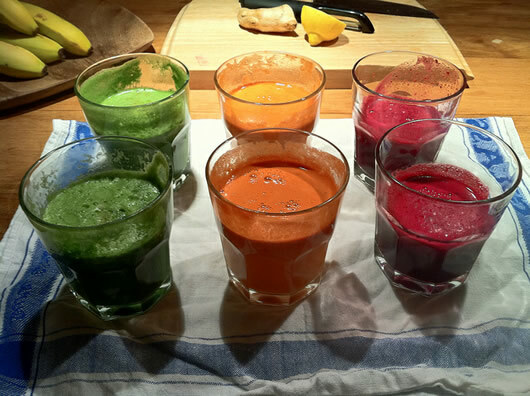 A good way to help keep your body alkalized on top of eating plenty of alkalizing vegetables is to drink freshly made vegetable juices. You could include watercress, kale, rocket, celery, fennel, cucumber, parsley, coriander, carrots and beetroots and throw in some alkalizing turmeric too for good measure. Super greens and rainbow coloured vegetables protect your tissues, cells and DNA from damage and help your skin to glow! As stress is a factor in your body’s acid alkaline balance it is important to make time to do relaxing activities such as gentle exercise, walking outdoors (with your dog if you have one), swimming, qi gong, yoga, pilates and/or taking massages or reflexology. All root vegetables e.g. carrots, sweet potato, butternut squash, pumpkin. All fruits are alkalising except the following which are acid forming: rhubarb, oranges, cooked tomatoes, and canned sugared glazed or preserved fruits, orange and cranberry juice. Raw / Unpasteurized antibiotic free grass fed buffallo milk. All meat, fish, seafood, eggs are acid forming! Avoid instead coffee, tea, cocoa, chocolate, vinegar, hot spices, salt, pepper, sugar and sweeteners because are all acid forming. If you want soft smooth skin you must eat plenty of essential fatty acids. You must get your EFA‘s by eating them as you cannot make them in your body. There are two types of EFA’s: Omega 6 Linoleic acid LA and Omega 3 a-Linolenic acid ALA.
Prostagladins are hormone like substances that are responsible for a multitude of bodily functions so any deficiency can lead to skin disorders such as eczema, acne and psoriasis, as well as depression, pre menstrual tension, attention deficit disorder, heart conditions and male infertility. Prostagladins are made when you eat your essential fatty acids. Caffeine, processed foods and over the counter drugs and trans-fats/ hydrogenated fats in deep fried foods, margarine, chocolate bars and supermarket cakes prevent you utilising essential fatty acids, so stay away from unnecessary medication and artificial if you want great skin. Good sources of EFA’s: extra virgin olive oil, hemp oil, almond nut butter, hazelnut butter, krill oil, chia seeds, pumpkin seeds, sunflower seeds, shelled hemp seeds, avocadoes, raw coconut oil. Did you know that your skin absorbs 60% of products used topically, natural or chemical? For this reason it is essential that you stop applying chemical products on your skin. If you want younger healthier looking skin then feed it topically. The best place to start is with dead sea salts which you can bathe. The Dead Sea is a completely landlocked body of water located in Jordan and Israel 1,300 feet below sea level. It is known as the lowest place on Earth. The Dead Sea was so named because no plants or animals can survive in this body of water because of the high salt content. The Dead Sea contains ten times more minerals and salts than the Mediterranean Sea. The salts obtained from the dead sea contain a diversity of minerals in high concentrations such as sodium, magnesium, potassium, calcium, bromides, and iodine. These minerals feed your skin and keep them happy and healthy. Sodium ions reduce scaly skin and patients who suffer from psoriasis (scaly, thick, red, itchy skin) have been shown to be deficient in magnesium, potassium helps to maintain skin moisture, calcium cleanses the pores of your skin and bromides are anti-inflammatory. So throw out the chemical lotions and potions and have a soothing bath in the dead sea (home made in your bath tub if you can’t make it to Jordan/Israel) and keep your skin happy and healthy. These gallstones are are clogging up your liver and gallbladder and in turn...your skin! So let's get them out. 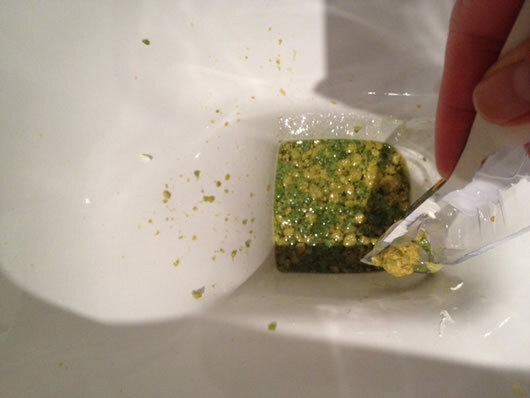 Cleansing your liver and gallbladder is more important and more effective than any facial treatment in a spa. Nearly every person with skin diseases such as acne eczema and psoriasis has gallstones in their liver and impure toxic blood (ref Andreas Moritz). Healthy skin can be rejuvenated through cleansing the liver and gallbladder of gallstones. This simple detoxification process means you can avoid Roaccutane and all of it’s nasty side effects such as severe psychiatric problems, inflammatory bowel disease, damage to the liver, kidneys, central nervous system, pancreas, cardiovascular system, musculoskeletal system, Crohn’s Disease, Hepatitis and Lupus. Roaccutane is not the answer for clear skin and certainly not good for a healthy state of mind. Antibiotics or the contraceptive pill prescribed for acne are not a good alternative either as they destroy the good bacteria in your gut which is what you are lacking in the first place if you suffer with skin conditions such as acne so would make no sense at all. Don’t give up on your quest for better skin. Perhaps you have already tried the medical route and seen that it doesn’t work or only offers short term relief or perhaps you are too scared to come off the pill, Roaccutane or repeated antibiotics for fear of your skin problems resurfacing. However the long term side effects from these drugs are not worth having and they are damaging your immune system. It’s time to peel off those temporary plaster and find a permanent solution for better, more beautiful, naturally glowing skin. Treating skin from the outside in, with medication, products or expensive facials is not the answer. Let’s treat skin from the inside out and feed your body an alkalising diet, high in essential fatty acids and zinc and low in alcohol, dairy and wheat, fried and processed foods and restore the healthy detoxification pathways of your colon and liver to achieve the skin you’ve always wanted and thought you’d never have! Your skin will thank you for it and your friends will watch you glow!